MILWAUKEE, WI, June 09, 2017 /24-7PressRelease/ — Kangaroo Brands, Inc. is excited to announce that all SANDWICH BROS. OF WISCONSIN(R) sandwiches are now made with all natural flatbread pockets. This announcement helps demonstrate to consumers that frozen, convenience foods can be healthy and REALLY…REALLY TASTY! SANDWICH BROS. Flatbread Pocket sandwiches are made with the highest quality ingredients. Fresh-baked, all natural flatbread pockets are filled with premium proteins like 100% Angus beef, antibiotic-free chicken, all natural JONES(R) sausage and real Wisconsin Cheese (of course). And they keep the bad stuff out like artificial flavors, trans fats, and high-fructose corn syrup. “At Sandwich Bros., we believe in the goodness of real, simple ingredients. 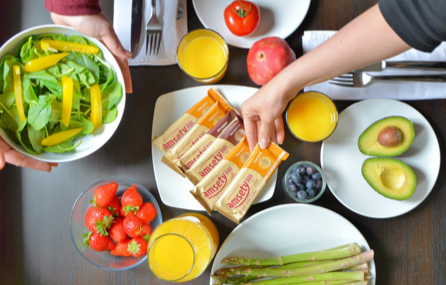 We partner with local Wisconsin companies to handcraft perfect portions for breakfast, snacks and light meals,” said Leigh Thornberry, Director of Marketing, Kangaroo Brands. “Sandwich Bros. are healthy, convenient and perfect for families of all sizes,” she added. To better illustrate their better-for-you ingredients, Sandwich Bros. is updating its packaging in an evolutionary approach to ensure it’s recognizable to its loyal consumers. The first iteration hits shelves in early Summer. These protein-packed sandwiches are not just following the healthy trend, but growing the handheld category. “Within the last 18 months, the national Sandwich Bros. brand quadrupled its retail distribution,” said Salem Kashou, President of Kangaroo Brands, Inc. The company continues growing the Sandwich Bros. brand by adding a new production line and hiring 40-60 employees by the end of 2017. “This is our third expansion in three years, and it will provide enough capacity to handcraft well over 500,000 sandwiches per day,” said Mr. Kashou. Always looking to satisfy consumers with quality and taste — that’s good for you, too — Sandwich Bros. launched Meatball Sliders in select markets. 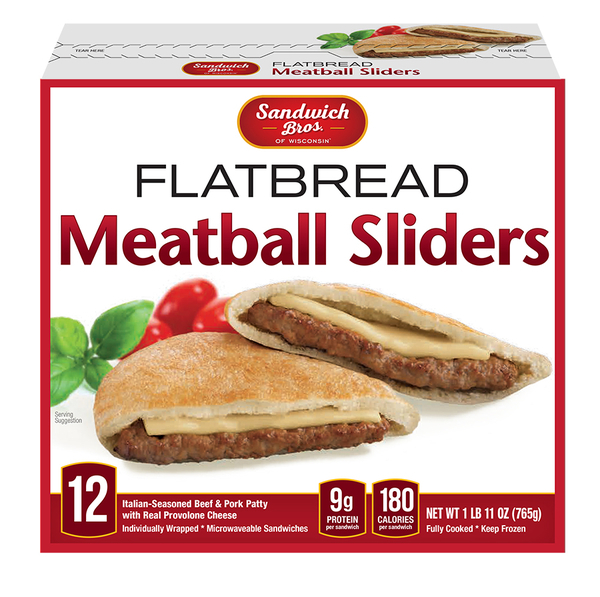 Meatball Sliders are made with Italian-seasoned beef & pork topped with real provolone cheese and hand-stuffed into all natural, fresh-baked flatbread pockets. –	Egg White & Turkey Sausage: All natural JONES turkey sausage and egg white omelet with Wisconsin cheddar cheese. –	Egg & Cheese: Whole egg omelet with a slice of Wisconsin American cheese. –	Sausage & Cheese: All natural JONES sausage with a slice of Wisconsin American cheese. –	Turkey Sausage & Cheese: All natural JONES turkey sausage and a slice of Wisconsin American cheese. –	Angus Cheeseburgers: 100% Angus beef with a slice of Wisconsin American cheese. –	Chicken Melts: Seasoned, all white chicken patty with a slice of Wisconsin American cheese. –	ABF Chicken Melts: Antibiotic-Free, all white chicken with a slice of Wisconsin American cheese. –	Gyro Sliders: Tender seasoned beef with herbed yogurt cheese. –	Meatball Sliders: Italian-seasoned beef & pork patty with real provolone cheese.